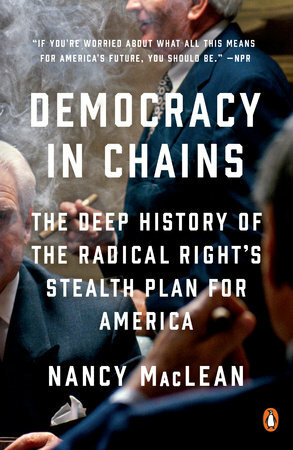 Even though the dust-up over Duke University historian Nancy MacLean in 2017 should have prepared me, I came away from my belated cover-to-cover read of Democracy in Chains: The Deep History of the Radical Right’s Stealth Plan for America even more deeply troubled than I expected. 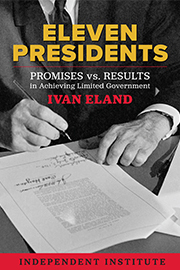 The book is a thoroughgoing attack on public-choice economics and the Nobel Prize–winning (1986) co-founder of the sub-discipline, James M. Buchanan. MacLean also sends broadsides toward Charles Koch and the Koch Foundation, but this extension of her argument is strained at best (perhaps a case of the tail wagging the dog?). MacLean’s disingenuous polemic is far more problematic than her obvious and shallow misrepresentations of leading scholars, the libertarian movement, and the academic discipline of public-choice economics. While dozens of MacLean’s critics have weighed in, two fundamental flaws in her work haven’t received enough discussion or play. 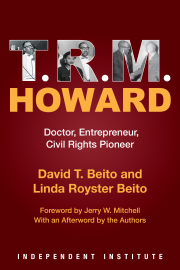 These errors, in my opinion, were severe enough that her book manuscript would not have been accepted as a graduate thesis or dissertation in the social sciences. If this book represents the state of art in the research and critical thinking in her field, History as an academic discipline is in serious intellectual trouble. Some reading this column might think I am simply overreacting because of my own background in public-choice analysis or because I hold a faculty position at a university with several public-choice economists. I have also publicly self-identified as a libertarian since the 1970s (although my thinking and place on the various spectra within the movement have evolved significantly). However, I do not self-identify or consider myself a public-choice economist, or a follower of James Buchanan. My career has focused on policy development and formulation, policy evaluation and impact, institutional design, the practical workings of government, and its impacts on the economy and citizens. I also specialize in urban economic development, land use, and housing, academic specialties far afield from typical public-choice analysis. Of the more 40 professional and academic publications, plus another 40 technical reports and policy studies, only a handful could be properly framed as public-choice analysis. My Ph.D. is in public administration (with concentrations in urban planning and public finance) from The Ohio State University. I would likely be tenured in departments of urban planning, public administration, or perhaps a highly interdisciplinary economics department with an applied focus on undergraduate and masters level education, but not a mainstream economics department with a doctoral program. In short, I have no personal or professional vested interest in rescuing James Buchanan’s reputation, or, for that matter, public-choice economics. Democracy in Chains, however, raises much more serious questions of academic integrity and the nature of scientific analysis generally. Given my own thirty years’ experience with policy change, policy impact evaluation, and the policymaking process, the inaccuracies and misrepresentations embedded in MacClean’s narrative made it a tough slog. As others have pointed out (see Duke University economist Michael Munger’s rebuttal, among others, here), MacLean clearly misrepresents the views of researchers and leaders in the libertarian movement as well as public-choice economists. Indeed, Russ Roberts, the eminently fair and balanced host of the popular EconTalk podcast, took the unusual move of saying publicly that MacLean owed an apology to George Mason University economist Tyler Cowen for her clear, incontrovertible misrepresentation of his views on democracy. (Not only did she decline to apologize, but she evaded the issue by obfuscating and diminishing the importance of misquoting him. ) She hasn’t softened or modified her interpretation or conclusions based on withering—and academically necessary—criticism. Recently, MacLean doubled down on her themes and conclusions at a lecture at Florida State University (which I attended). Despite the increasingly voluminous articles criticizing (and defending) MacLean, I believe two issues in the controversy have not been adequately addressed or vetted. First, despite its subtitle, MacLean’s book is stylistically and methodologically a polemic, not deep research or scholarly analysis. Or at least her book does not represent the research thresholds expected in social sciences. While she has a thesis and collects data, her methods are rhetorical, lack rigor, draw on popular journalism rather than academic analysis, and narrowly construct the data to support her thesis rather than test its validity. Economist Steve Horwitz and others have claimed that this is an example of “confirmation bias”—the tendency for researchers to look for evidence that supports their thesis even when faced with contrary evidence. I think this conclusion is too charitable. My reading of Democracy in Chains suggests she never seriously looked for contrary evidence. This lack of skepticism is a fundamental break from accepted, mainstream scientific methods. Skepticism, in fact, is embedded in the concept of hypothesis testing. Whether a hypothesis is valid depends on whether it holds up to evidence that might confirm or disprove it. The ethical, professional, and practical duty of the scientist is to collect all the relevant data, or as much as practical, to test the validity of the hypothesis. MacLean apparently feels she is under no obligation to present, let alone evaluate, alternative data. She does not, for example, present any contrary data about Buchanan’s beliefs in the so-called white male patriarchy or endemic racism, even though she had easy access to three former presidents of the Public Choice Society on her own campus who could have provided insight into Buchanan’s values, motivations, and his behavior. As someone who was an integral part of the first wave of state-based free-market think tanks (as a co-founder of an Ohio think tank in 1989), I can attest to the fact that Buchanan was far down the list of influential thinkers and intellectuals for most libertarians. My libertarian education, for example, began in earnest when, as a high school student, I read Murray Rothbard’s For A New Liberty: A Libertarian Manifesto and Henry Hazlett’s Foundations of Morality in the 1970s. My education continued as an undergraduate through academic study (in supervised independent study courses, not mainstream classes) of F. A. Hayek’s Constitution of Liberty and Ludwig von Mises’s Human Action. I was not introduced to Buchanan’s work in a rigorous way until I began graduate work at George Mason University in 1987, a full two years after my applied research in urban development and policy began while working toward a masters degree at Wright State University. While an important figure, Buchanan was not the person most libertarians looked to first for intellectual clarity or inspiration. For someone truly knowledgeable about the modern libertarian movement and public-choice economics, processing the substance of MacLean’s argument is a bit like Alice peering through the looking glass. MacLean has conjured up fanciful creatures with exaggerated features and odd worldviews only tangentially connected to the real world. She has created a work of narrative nonfiction, or creative nonfiction, but certainly not history in an objective sense (let alone “deep” history). In fact, her analysis is so shallow and superficial, her efforts have created a fictional story best suited for entertaining conspiracy-obsessed fans on the left than providing anything meaningful for public discourse in today’s political environment. Nevertheless, Democracy in Chains is very well written in terms of structure and rhetoric, even if the foundation on which the narrative rests is ephemeral and unstable at best. MacLean’s prose is clean and polished, even masterful at times. Her argumentative structure is cogent and logical. 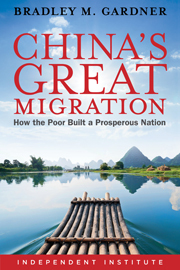 The book itself might rank as one of the best polemics on politics published in recent years. But Democracy in Chains is not being promoted or branded as a polemic. 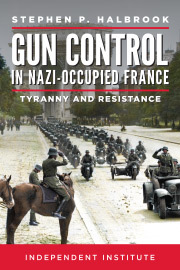 Rather, it’s projected by the author and the publisher as history, a deep history at that. As history, Democracy in Chains raises the spectre of academic ethics. MacLean has not just failed to find contrary evidence. She has intentionally excluded it. MacLean limits her research just to Buchanan’s documents trying, she says, to understand the man. Then she “reads between the lines” to make judgments about his intentions, motivations, and character. In the process, she intentionally ignores vast swaths of information about the libertarian movement, James Buchanan, and public-choice economics as an academic discipline that would have provided contrary evidence to her main hypothesis. She doesn’t even interview professionals who knew, worked with or studied under Buchanan. Indeed, when asked, she dismisses the relevance of these sources—a blatant disregard for principles of qualitative research—by categorically saying (without evidence) they would simply provide supporting testimony for Buchanan because of loyalty. This failure to follow basic research standards leads her to misrepresent the sources she does cite. One paragraph (among many) discussed prison privatization. The radical right’s mission, she writes in the paragraph’s first sentence, “pushes for corporate prisons,” implying a lack of skepticism by its proponents about the consequences of privatization. (Note the term “corporate prisons” rather the more common but also inaccurate term “privatization.”) She takes specific aim at Alexander Tabarrok (pp. 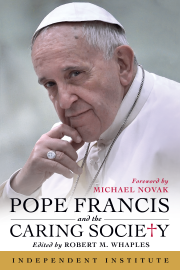 218-219) and his edited book Changing the Guard (published by the Independent Institute). Tabarrok is a Ph.D. economist who holds a named chair at George Mason University and is the author or coauthor of eleven books and over fifty academic journal articles. These academic credentials are not provided to the reader for context even though they were literally one or possibly two clicks away with a decent internet search engine. Instead, MacLean characterizes Tabarrok’s work as part of the partisan, right-wing conspiracy without qualification or nuance. “The mission [of prison privatization],” she writes, “seems important enough that Alexander Tabarrok, a GMU economist then moonlighting as research director for the Koch-funded Independent Institute, issued a whole book on the subject in 2003, with the coy title Changing the Guard.” (p. 218) MacLean’s rhetorical sleight of hand intentionally diminishes Tabarrok’s professional accomplishments and identity by tagging him with a Koch-funded think tank, with no evidence that the project was actually funded by a Koch-affiliated foundation. (In fact, the Independent Institute received no Koch funding for or during the book project.) Tabarrok is presented as a tool of the “radical right’s” master plan. Indeed, MacLean’s rhetorical tone suggests that prison privatization is so important to the so-called radical right that Tabarrok is driven to “moonlight” as research director for a think tank to edit “a whole book.” A whole book! This must be important, right? As a historian, MacLean knows that books are valued and often essential part of the promotion and tenure process for historians. A book on a curriculum vitae would be routine and expected, not an exception, hardly necessitating such a qualifier. MacLean also neglects to mention that most policy books are driven by the interests of the individual researchers, not commissioned for a movement. She also does not provide any evidence that the peer-reviewed Changing the Guard was a commissioned work. MacLean’s tone and rhetorical structure suggests that Tabarrok’s work is somehow an example of how the radical right creates policy discussion. She does not bother to mention that the potential benefits and disadvantages of prison privatization are actively discussed in the mainstream policy and criminal justice community. A quick Google Scholar search using the search term “prison privatization” brought up six books and 30 citations in the first three pages of the search (among more than 13,000 results) for work published prior to 2003. (Note and disclosure: I organized a conference on the topic, which included supporters and critics of prison privatization to identify areas of agreement, disagreement, and common ground in 2015.) MacLean then has the audacity to criticize Tabarrok for not considering alternative interpretations. MacLean’s paragraph, which is about 150 words long spanning four very long sentences, concludes with the following: “While warning of ‘special-interest groups,’ in particular the correctional agencies and the prison guard unions that push for more prison spending, he neglected to note how the profit motive could lead private prison corporations to push for tougher sentencing to drive up prison populations and to cut costly items such as job training and substance abuse counseling.” The only citation to the entire paragraph, which includes MacLean’s own commentary on the policy issue, is to Tabarrok’s book Changing the Guard and comes at the end. Mechanically, distinguishing between Tabarrok and MacLean’s ideas is virtually impossible except for the quoted text which is presented in the middle of the paragraph. Democracy in Chains is plagued with similarly ambiguous and mixed citations, making fact and quote verification nearly impossible without dedicated research assistants and access to the papers she cites. Unfortunately, this misrepresentation of Tabarrok’s views and work is the norm, not the exception, in Democracy in Chains. MacLean’s shoddy research methods, conspiracy driven hypothesis, and inability to give an authentic voice to her subjects casts a pall over the discipline of history. If history’s most prominent and notable scholars cannot distinguish between a polemic, substantive academic discourse, or sound social science research (qualitative or quantitative), the discipline is facing increasing marginalization and relevance. Paradoxically, MacLean writes in areas I have keen personal and professional interests—social movements, social justice, racism, public policy, and social change. My earliest research focused on economic development in marginalized urban communities, and my policy work embeds empowerment in its lens. My research also includes a strong historical component. My education in economic history, as well as relationships with historians interested in balance and thorough research, allowed me to pick up a book or read an article thinking that historical accuracy was a valued principle of the research. No longer. Nancy MacLean and Democracy in Chains have disabused me of the naive belief that academic historians are interested in objectivity. Reading history texts must now be filtered through deep skepticism of the source, as well as research on the author to understand how their personal and professional biases influenced their conclusions. As an academic discipline, history is much less valuable to understanding and acting on broader questions of public and social policy as a result. In trying to prove her point, Nancy MacLean has marginalized her profession and discipline. This is an unfortunate consequence for all academia.